We install 5-inch or 6-inch gutter depending on your homes needs. The process is simple: Our aluminum comes in large coils and is shaped by our gutter machine to form the K-style seamless gutter that we cut to fit the exact measurements of your home. Seamless gutters do not leak like their non seamless counterparts. The only areas that have a seam are the corners. These corners are bound together using a preformed piece of aluminum called a mitre. These mitres are fastened to the corners and sealed leaving them leak proof. Our gutters are installed using hidden hangers, placed sixteen inches apart or closer if needed. These hangers, stronger than the traditional spike-and-ferrule method, are inter locked into the gutter, providing a sleek, clean look. Depending on the fascia used on your home, it may be necessary for us to use roof hangers, colored to match your roof, or hidden strap hangers that are secured under the shingles, hiding the hanger. These methods are used on homes that have crown molding or little to no fascia. The downspout we use comes in two sizes: 2×3 inch and 3×4 inch. The standard is 2×3 though the 3×4 will be used if there is a large quantity of water. Like the gutter our downspout comes in a variety of color allowing us to match the gutter, or in many cases, we will try and match the downspout to the color of your siding. JCH Seamless Gutters inc. offers what many gutter companies won’t, Copper and Galvanized Steel half rounds. These gutters will not rust or rot and will enhance the visual appeal of your home. They come in 5-inch or 6-inch, but larger sizes can be ordered. Half rounds are unique and add beauty and boldness to the outside of your home. This form requires special tools and skills to install. This effort is clearly seen in the final product. JCH Seamless Gutters inc. will tear-down and haul-away your old plastic or aluminum gutters, while sealing any holes in the fascia that are exposed. If you have a steel roof and are in need of gutters we can accommodate you. We begin by precisely trimming any excess overhang that may cause the water to rush over top of the gutter. Then using special hangers spaced an average of 12-inches apart we attach the gutter to the fascia making conscious note of the ‘snow slide line.’ If a gutter is left above the ‘snow slide line’ there is a possibility that under the right circumstances the snow will collide with the gutter either bringing it to the ground or damaging its structural integrity. Leaf Relief® by Ply Gem. Leaf Relief mounts directly to the gutter. It stays firmly in place to resist wind, snow, ice, and pest invasions. 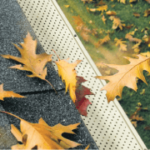 Leaf Relief is more effective than other types of gutter protection because of its Aluma-Perf™ technology. This keeps leaves, pine needles, seeds, and twigs out of your gutters. Leaf Relief fits all brackets, is virtually invisible from the ground, and never caves in. 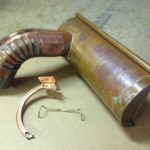 It is available for 5-inch and 6-inch gutter and comes in copper as well. Copyright © 2017 JCH Seamless Gutters Inc. All rights reserved.